Here's something unusual, a Villiers-engined Excelsior. The model is a Scout and is from around 1934. Not too sure where the photo was taken but the number plate of the bike definitely isn't British, it says 'Vic' on it, maybe this is Victoria, Australia? 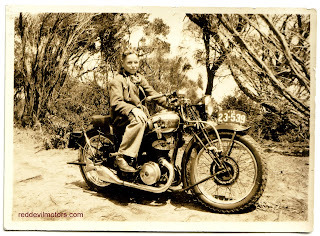 The caption on the reverse of the picture is, "This is Jack taken on a mates Motor Bike" sic. 1934. The bike is fitted with a 250cc Villiers motor. My gosh, that is an elaborate front wheel speedometer drive! I suspect with that very tall gearing he often saw the ton on the speedo at least!